The Red Wings had eight power-play opportunities, striking only once in a 4-2 loss to the Minnesota Wild on Friday night. It was the first game of the annual Prospect Tournament in Traverse City. Nerves were visible and mistakes were made, but the energy level shown by Detroit and Minnesota was noticeably strong. It was a physical battle all night long, with big bodies on both sides. Wild prospects Jordan Greenway, Louie Belpedio and Josh Thrower showed their size, as did Detroit’s Givani Smith and Cole Fraser. The first period was dominated early by the Wild. Just past the midway mark, forward Dmitry Sokolov scored on the power play (one of four PP opportunities Minnesota would have). It was a clean wrist shot, beating goaltender Patrik Rybar (Czech) in close. Fortunately for Detroit, Filip Zadina was able to answer with a blast of his own on the man-advantage. With 1:15 to play, he ripped home a one-timer from the top of the right circle, tying the game. Shots were nearly even. Penalties were plentiful, as each period had four calls (including six slashing minors). Detroit, however, was unable to cash in on these prime chances, despite their potentially lethal top power-play unit consisting of Smith, Michael Rasmussen, and Joe Veleno, with Dennis Cholowski and Zadina on the point. Coach Ben Simon attributed the lack of success 5-on-4 to a small window of practice time. Zadina, despite scoring in the first, had a bit of a slow start to the tournament. It seemed as though Minnesota was simply out-muscling Detroit at some points, with Greenway leading the way with his 6-6, 226 lb frame. Rybar, standing 6-3, was screened by Greenway as he took control of the area around the crease, screening the Czech goalie every chance he could take. Simon thought Rybar was ‘phenomenal,’ especially for the first game. 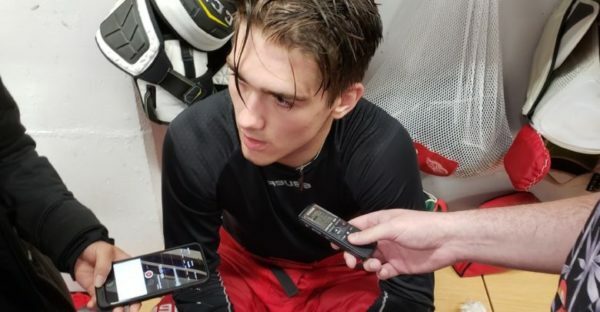 Zadina was not intimidated by the physicality. The second period was noticeably weak for Detroit, as they had all four power plays, failing on each. Cholowski had a great scoring chance in the slot but waited far too long and the defender was able to get block it with his stick. There were a few other opportunities where Wings players hesitated too long. David Pope nearly scored, ripping a slap shot off the post. Wild forward Ivan Lodnia gave his team the lead with assists from Greenway and Gerry Fitzgerald (all three of these players had outstanding games, and they combined for six points). Early in the second, Smith was provoked by Thrower, who dropped the gloves. Smith did not oblige, choosing not to engage in a fight, something he is known to do from time-to-time. Coach Simon said the team as a whole showed good discipline. One minute later, Jared McIsaac (2018 2nd round pick) scored with a nice long shot, while Rasmussen screened goalie Kaapo Kahkonen. Damien Giroux then potted the empty net tally with seven seconds to play in the game. Givani Smith played very well. In addition to showing good discipline throughout the contest, he also had some very nice plays. His play was indicative of his experience at these prospect events. Detroit hopes to bounce back tonight against the Dallas Stars, of which former Grand Rapids Griffins head coach Todd Nelson is now an assistant coach. Dallas, down 5-3 in the third period, rebounded with four unanswered goals to beat the Rangers last night. The Wings have their work cut out for them in this matchup. Cole Fraser gave up his position trying to make a big hit at the blue line a couple times. He sometimes sacrifices his defensive play for his physical play, sometimes to his detriment. He is also a bit clumsy at times. I thought defenseman Jared McIsaac played really well. He’s a smart player, didn’t make any noticeable errors, and knows where his teammates are on the ice. Very good puck skills and hockey sense. Defenseman Vili Saarijarvi was absent during the third period, leading to the Wings working with five D the rest of the game. Zadina took a stick to the face at the end of the first period but appeared to be fine the rest of the game. I wanted to see more from Joe Veleno. He didn’t show much in this first game, but he has strong playmaking abilities. Hopefully, some of those skills will be showcased this weekend. Fox Sports Go, as well as various team websites, are streaming every game of this tournament. Follow me on Twitter @KevinSporkaHOHM for continued coverage of the Prospect TTournamentall weekend long.